Former Indian Prime Minister Atal Bihari Vajpayee has died at the age of 93 following a prolonged illness, according to a hospital statement on Thursday (August 16, 2018). 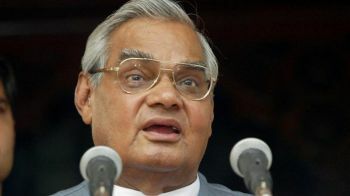 A Hindu nationalist from the Bharatiya Janata Party (BJP), Vajpayee had been hospitalised since June with a kidney infection and chest congestion. Reports emerged on Thursday morning that Vajpayee was in a critical condition after top Indian politicians visited him in New Dehli's All India Institute of Medical Science. "Despite the best of efforts, we have lost him today. We join the nation in deeply mourning this great loss," a statement from the hospital read. The government announced seven days of state morning to honour the former prime minister, who was admitted to hospital on June 11. Vajpayee served as India's prime minister three times: for 13 days in 1996, 11 months in 1998 to 1999 and then from 1999 to 2004. He also served decades in parliament, and was a foreign minister from 1977 to 1980. He believed that India should enshrine Hindu culture, but he opposed discrimination against other religions. Vajpayee was one of the few BJP leaders to express anguish when hundreds of Muslims were killed in 2002 during religious riots in the western state of Gujarat, governed at the time by India's current Prime Minister Narendra Modi. He called the 1992 destruction of a 16th-century mosque on a disputed site by Hindu fanatics India's darkest hour. The BJP government run by Vajpayee acknowledged that Muslims felt especially disenfranchised and advocated for integrating them more into the mainstream. Commenting on the news of his death, Modi said Vajpayee's stewardship had put India on a fast track to growth. "It was Atal Ji's exemplary leadership that set the foundations for a strong, prosperous and inclusive India in the 21st century," Modi said in a tweet. Vajpayee was a key figure in the development of India's nuclear programme and gave the go-ahead for underground nuclear tests in 1998, believing nuclear weapons would be a deterrent against China and Pakistan. "We will not use these weapons against anybody. But to defend ourselves, if the need arises, we will not hesitate," Vajpayee vowed at that time. Pakistan responded to those tests with six of its own, launching both countries on a race to amass the weapons. But it was the same Vajpayee who later embarked on a historic bus ride to the Pakistani city of Lahore and met then-premier Nawaz Sharif in an attempt to ease tensions. The former journalist and poet-turned-politican was born on December 25, 1924, to a family of high-caste Brahmins. As a teenager he approached the communist's ranks, but ended up joining the National Voluntary Service, a right-wing paramilitary group that was a force behind Hindu nationalism, according to a report by The New York Times. An opponent of British colonialism, he went into law and journalism before entering politics. His more than five-decade-long political career peaked in the 1990s, when his oratory attracted tens of thousands of people to his rallies across the country. A published poet, he was viewed more as a philosopher and less as a hard-nosed politician, according To The Washington Post. Vajpayee's often conciliatory tone was popular on both sides of the political spectrum.He also became the first non-Congress leader since India's independence in 1947 to complete an entire term in office as head of a BJP-led ruling alliance between March 1998 and May 2004. He was ousted in 2004 elections by the Congress Party led by Sonia Gandhi, which selected Manmohan Singh as prime minister. "Shri Vajpayee Ji stood among the tallest leaders of modern India, who spent his whole life serving our great country. His services to our nation will be remembered for a long time to come," Singh said on Thursday. Congress leader Rahul Gandhi said millions "loved and respected" Vajpayee. He retired from politics in 2005, four years before suffering a stroke that made him retreat from public view. "I will not participate in any electoral politics," the New York Times quoted him as saying aged 81.